The Traveling Wilburys began after George's comeback album; Cloud Nine was completed, George had to create a bonus track for the European twelve inch version of 'When We Was Fab'. Since Jeff Lynne helped in the creation of George's album, he postponed his other projects: work on Roy Orbison's album Mystery Girl, and work on tracks for Tom Petty. The two Englishmen discussed this over lunch in L.A. That Roy was so well versed in the Monty Python genre of British comedy. George was delighted when Roy volunteered to sing with him on the extra track. It wasn't worth booking anywhere expensive so George telephoned Bob Dylan in Santa Monica whose garage was available for recording in the next day. Rolling up late the following morning, Roy shook hands with guitarist Tom Petty, whose group had backed Dylan on the tour that had terminated at Wembley. Petty had nothing better to do, so he tagged along. Dylan lent a hand when Harrison - with his B-Side only half-finished. Give us some lyrics, you famous lyricist! George added what he called 'a lonely bit' for Orbison, while Dylan wheezed the trademark harmonica on the fade. The album was completed over the summer of 1988. Most of the composing took place at the house of Dylan's then producer, Dave Stewart. Nourished by a continuous barbecue, George's team would plan all afternoon and night. Due to Dylan's upcoming tour, only ten days could be set aside for recording. During the production of Cloud Nine, studio errors were caused by little gremlins called Wilburys. First, 'The Trembling Wilburys' was suggested as a name, but Bob's suggestion Traveling won. Later, Harrison would consider the likelihood of a full-length movie based on the sleevenotes attributed to Michael Palin from a brainwave of Derek Taylors. Masquerading as half brothers sired by the same father - Charles Truscott Wilbury Senior - the five appeared under their chosen pseudonyms. All About Jazz musician pages are maintained by musicians, publicists and trusted members like you. Interested? 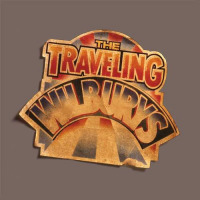 Tell us why you would like to improve the Traveling Wilburys musician page.